Moving ever closer to shutting the book on the drawn-out saga of Madagascar's presidential elections, seen as a long-awaited first step in solving the years-long political crisis that has gripped the island, the country's election commission declared on January 10, 2014 that Hery Rajaonarimampianina, the finance minister of the transitional government, is the winner of the vote's second round. But opponent Jean-Louis Robinson immediately cried fraud, and amidst the uncertainty related to the election results, the army fired on students protesting in Mahajanga, Madagascar's largest western coastal town. One student died and 11 others were injured. It is unclear whether the protests were related to the pending decision of the CES. Today 10 Jan. 2014 was a deadly day in Mahajanga. The Boeny capital has been shaken by confrontations between the army and students. The country's last democratically elected president, Marc Ravalomanana, was ousted during a military-backed coup in 2009. After multiple delays, elections were finally held on October 25, 2013 and a run-off on December 20. Many viewed the vote as a proxy battle between the ousted President Ravalomanana and President of the Transition Andry Rajoelina, who toppled Ravalomanana in the coup. President-elect Rajaonarimampianina was Rajoelina's budget and finance minister; Robinson worked as a minister in Ravalomanana's government. According to the Malagasy Election Commission (CENI-T), with 98.89 percent of the results in, Rajaonarimampianina won the second round with 53.5 percent, compared with Robinson's 46.5 percent. However, Robinson is challenging the decision and has sent evidence of allegedly massive fraud [fr] to the Special Electoral Court (CES), claiming to have actually won 56 percent of the total vote. The CES is the only institution [fr] that can pronounce the definitive winner of the election, and must issue a ruling by January 19. 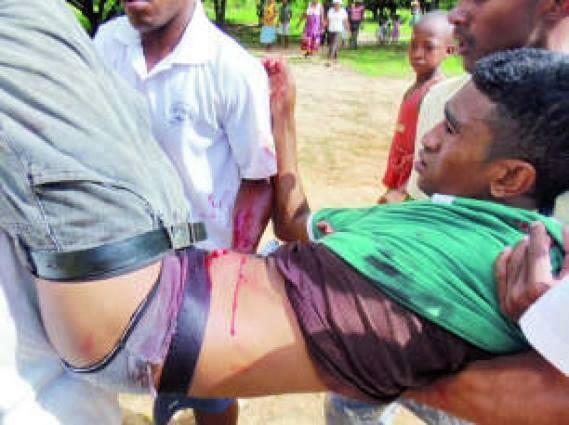 Students injured during protests in Mahajanga via @RavakaN on Twitter. Used with permission. Complains and requests lodged by Robinson and his staff are likely to give a lot to deal with to the electoral judges. The request for disqualification of candidate Rajaonarimampianina alone happens to be as long as 120 pages. One parliament member who swore allegiance to the Opposition has, in addition to this, required the very show election held on December 20th to be canceled as a whole because of the too large amount of frauds spotted across the island. The largest part of the other request mainly target the invalidation of votes awarded to the transitional ruling power's champion. The electoral showdown is nowhere near to an end. The Special Electoral Court will decide and ultimately release the presidential elections’ second round's final results by mid-January. The Electoral Commission releases its own temporary results on January 3rd. The very same outrage was caused by the development of legislative elections held together with the presidential elections. The Special Electoral Court has a pack of complains to read about it too. Independent and Opposition candidates jointly denounced frauds which occurred in favor of candidates supporting and supported by transitional leader Andry Rajoelina. The movement capitalized in street protests in Morondava city in the West of the island. Virtually no progress was made for four years with the economy contracting severely. Political and economic progress has limped along since. A new rugby stadium is one of the only tangible accomplishments of the “transitional” regime led by Andry Rajoelina, who is now close to completing a full electoral mandate. …As international praise pours in, so too may international aid—a critical lynchpin of development and state budgeting for the deeply impoverished island. Donors are eager to come back and disburse long overdue payments slated for projects canceled during the crisis. For the first time in our history, this electoral commission has members chosen from the civil society (high-ranked civil servants, lawyers, journalists, teachers or magistrates) and from all the political parties who took part to the Transition phase. The CENI-T also heavily benefited from the support of international bodies such as the UE, UN or SADC whether for financial or implementation issues. For the first time in our history, we have a dedicated website with regular updates of votes at the National, Regional, District and Polling Station levels. The level of transparency given to our citizens has never been higher. Just remember how 1997, 2001, or 2006 (see page 30 of the report) elections were run. For the first time in our history, thanks to the internet and the data framework the CENI-T is providing us, we had bloggers who did an incredible job of making projections during the first round of votes. And final results were actually very close to those extrapolations — a stark example that no significant anomalies happened in the first round count. Pure maths. No politics. His family name alone racks up an impressive 19 characters and (we think) nine syllables. 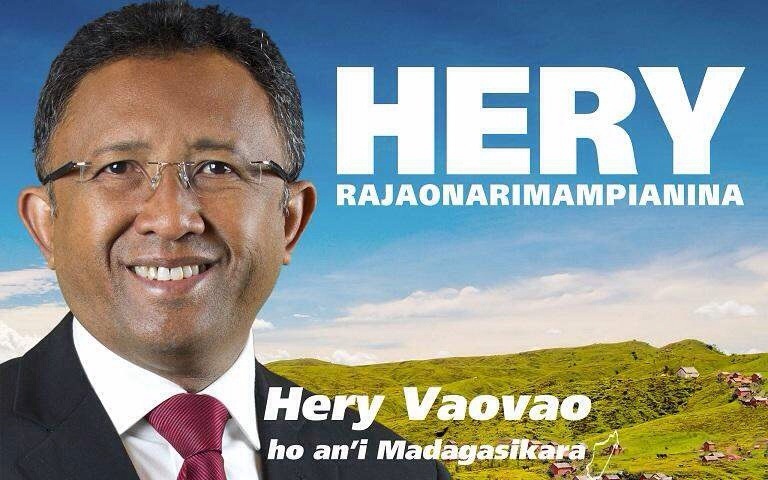 His full name – Hery Martial Rakotoarimanana Rajaonarimampianina – totals 44 characters. One would assume that repeating three years in primary education just to master the spelling of his name would hold Rajaonarimampianina back in life (we have no evidence that happened) but on the basis of our story, it appears that a long name can be good for a career in politics. Slate Africa teaches its readers how to pronounce Malagasy names and explaining why they are so long. The linguist Narivelo Rajaonarimanana emphasizes that the Malagasy name is not a label. It is a wish, a destiny, a counterattack to an unfortunate destiny, a recollection of one's birthday, a combination of names of parents or ancestors. Astrology plays an important role in attributing names. This practice is still very much applied in rural areas, where one can summon an ombiasy (shaman) and where one often uses horoscopes. A study by Samuel Rasolomano and published in 1905 by the journal Mitari-dalana counts 24 sources for Malagasy names. Amongst them, one sees most often expression of character (physical or moral one), love of children (promise of an unconditional love, replacement of a lost child etc…), prestige (wealth, honor, etc.) as inspirations for names, together with astrology. Therefore, names are used as a mnemotechnical means to remember one person's destiny.